The Budget Portal presents House and Senate versions of budget bills. The Governor’s Introduced budget typically becomes two identical budget bills, House Introduced and Senate Introduced, which are amended by their respective bodies. (One difference… when you are viewing the Senate bill, and you view item amendments, you will not see the House amendments, and vice versa.) It is customary for the House version to advance through the legislative process. For this reason, you may see additional versions of the House Budget Bill. Click on a version link to view details for that particular budget bill. The Introduced version shows the budget bill as proposed by the Governor. The Enrolled version includes all legislative amendments agreed to by both the House and Senate. Any of the Governor’s modification to the Enrolled budget are incorporated into the Reenrolled version. The Chapter version of the budget represents the budget as enacted into law. The details of the budget bill are organized into a table of contents. Here you can select items and totals for viewing. Budget totals are provided for Departments, Secretariats, and Agencies. To view the total positions and fund sources, select the dollar sign icon beside the Part, Department, Secretariat, or Agency name. The first level of the table of contents shows links for Departments and Secretariats for Part 1. Click on one of the links to get to the second level of the table of contents. 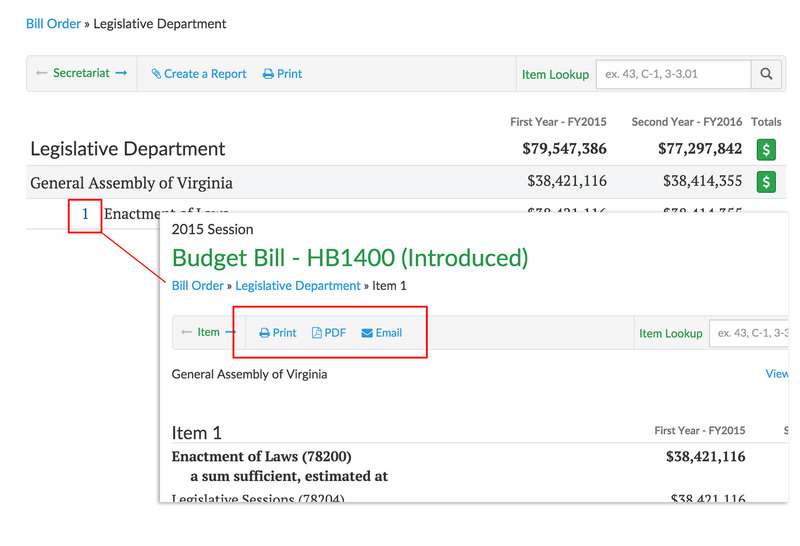 On the second level, (i.e., after clicking on Legislative Department above) you can click on an item number to view the text of the item. 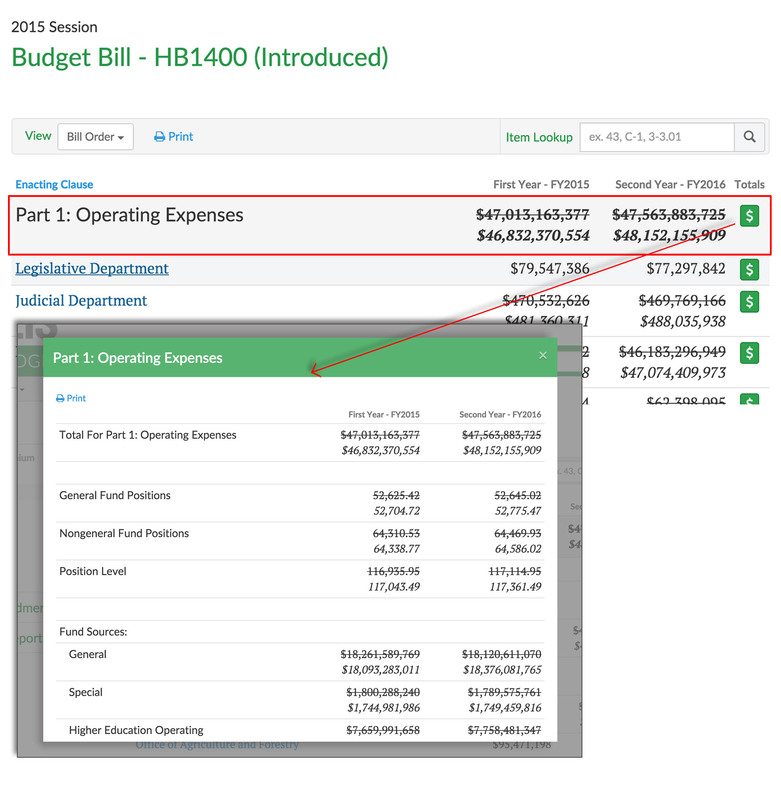 There are three viewing options for the Budget Bill, which you can choose from the View drop-down: Bill Order view, Agency view, or All Items view. There are also options on this menu to view the full pdf and bill history. Enacting Clause - provides an overview of the anticipated revenues and operating expenses to be appropriated. Part 1 – Operating Expenses - itemizes the dollar amounts that are appropriated to state agencies. Part 2 – Capital Project Expenses - itemizes the dollar amounts appropriated for one-time costs of building, improving, or repairing government facilities. Part 3 – Miscellaneous - sets forth actions affecting state debt, various revenue transactions, and interfund transfers. Part 4 – General Provisions - sets forth general operating policies, such as prerequisites for payment. 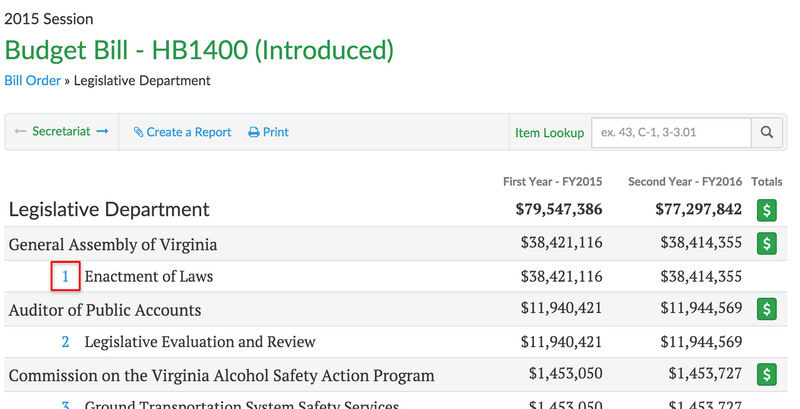 The Agency view displays all state agencies and entities in alphabetical order for which appropriations are proposed. For ease of locating an agency/entity, “Department of,” and “Secretary of,” are listed at the end of the agency’s name. “9(C) Revenue Bonds and 9(D) Revenue Bonds” refer to Section 9 - State debt, subsections (C) and (D) of Article X, of the Constitution of Virginia, for which those bonds are authorized. The All items view displays all items in numerical order. Part 1, Operating Expenses: begins with item 1 and continues upward. Part 2, Capital Project Expenses: each item contains the prefix “C-”, beginning with Item C-1. Part 3, Miscellaneous: each item contains the prefix “3-”, beginning with Item 3-1.01. Part 4, General Provisions: each item contains the prefix “4-”, beginning with Item 4-0.00. The Full PDF view will provide you an option to download or open a PDF version of the entire budget bill. These PDF copies have line numbers beside each line of text which can be used for reference to amendments that are made on the bill. Chapter versions of a budget bill do not have line numbers. 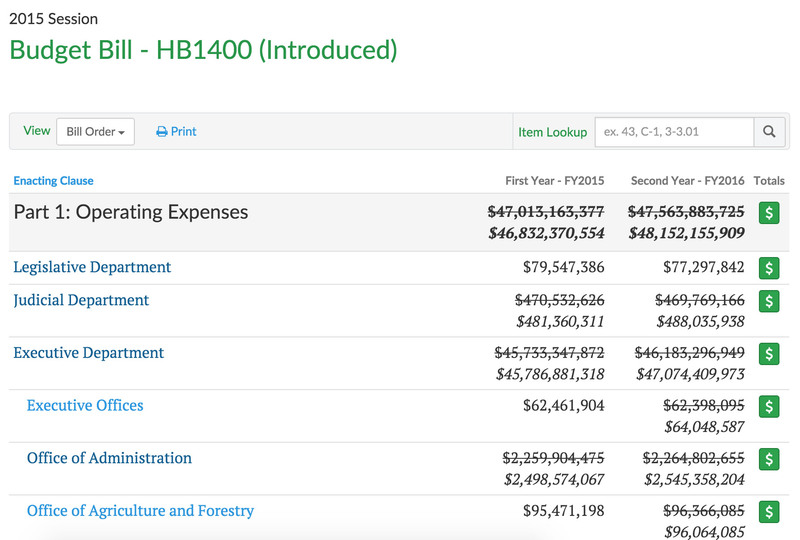 By selecting View History, a new browser page will open to the history page for the budget bill. All actions taken on the bill will be displayed, from Introduction, through Committee actions, Floor actions, Enrollment, and Enactment, together with any required votes for those actions. All text versions of the bill are available, as well as how members voted on a particular action. There are several options available once an item has been selected: view previous or next item within the Budget Bill view, print the item, create a PDF of the item, or email the item. Breadcrumbs are displayed at the top of each page. The selected view is displayed first, followed by the location, followed by the current page. Click on a breadcrumb link to go back a level or two.